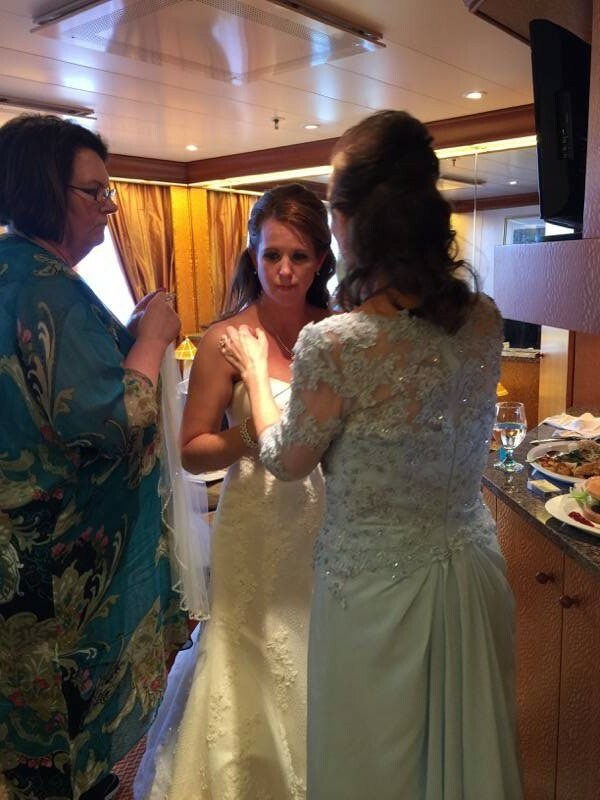 I can’t believe it’s been over a month since I married my best friend on the Carnival Miracle (more posts to come for sure!!!)!!! 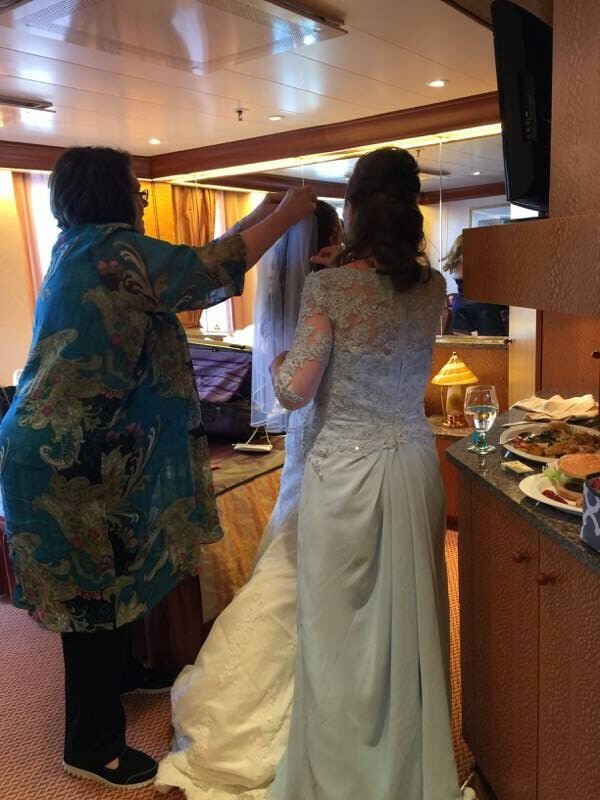 I was so excited to wear my beautiful wedding dress and have my hair done as well. I went back and forth on whether I was going to do my own makeup and decided that I was going to take the plunge and indeed do my own makeup (all but my fake eyelashes)! I think it turned out pretty dang good if I don’t say so myself! 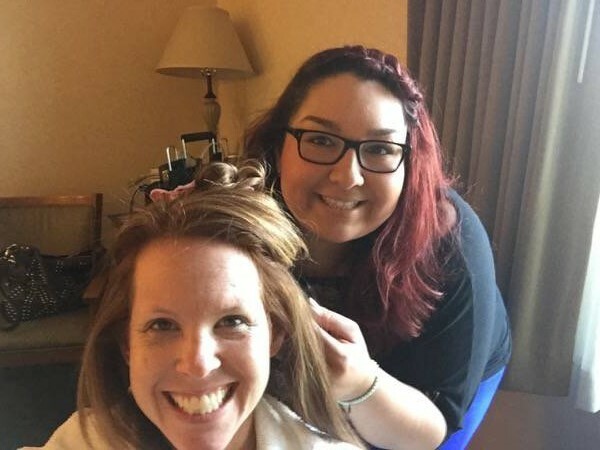 I woke up super early to get my hair done – keep in mind we had to be at the Port of Long Beach Cruise Terminal by 9:30 a.m. Jessica from JL Hairstyling came to our hotel room and did my mom’s and my hair for the wedding. 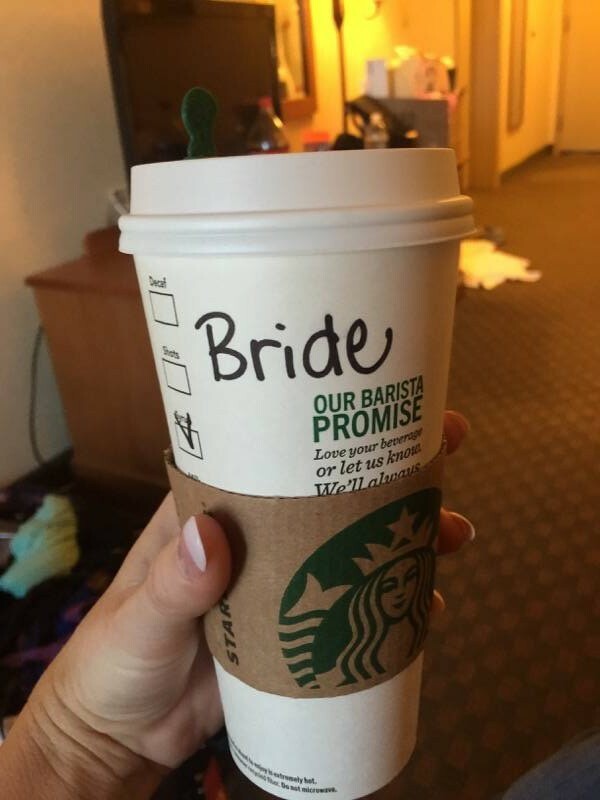 My maid of honor (and best friend), Colleen, surprised me with a Venti Vanilla Latte (my favorite drink) from Starbucks with “Bride” written on it and a drink for the groom as well. I was on the fence of whether I would have my hair half up or all the way up for the wedding. I didn’t get a chance to have a trial run because she was all the way in Long Beach. 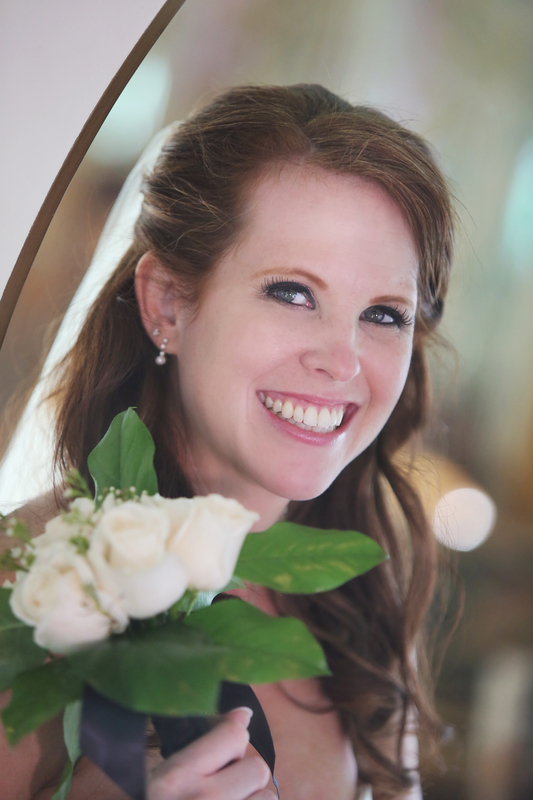 I really loved the Chignon Bun for a while, but when I went to bed the night before our wedding, I knew that I wanted my hair half up, half down for the wedding. I searched through Pinterest and shared the pics with Jessica. 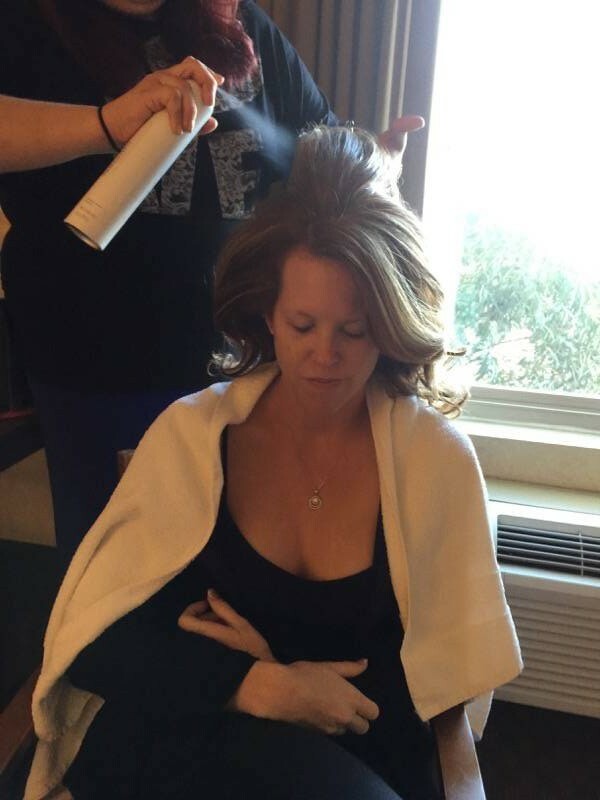 I felt so pampered and relaxed the morning of our wedding. I love having my hair done! I couldn’t wait to show my soon-to-be husband! I had also purchased some pretty bobby pins with pearls to go in my hair as well. 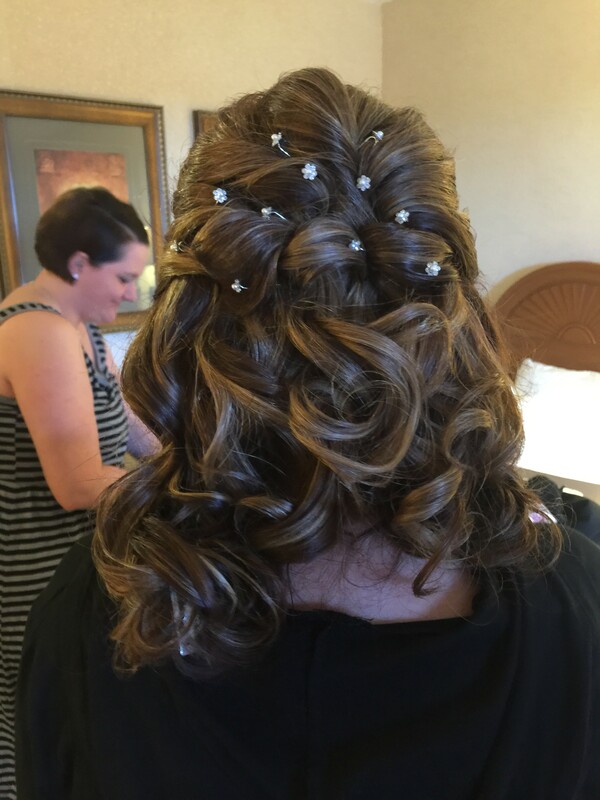 Jessica did an amazing job with my bridal hair up-do! It was pretty windy at the Port of Long Beach Cruise Terminal and my hair had fallen down a little – but amazingly it looked like it was supposed to do that. When I finally made it our cabin to get dressed, my maid of honor and bridesmaids helped touch me up. 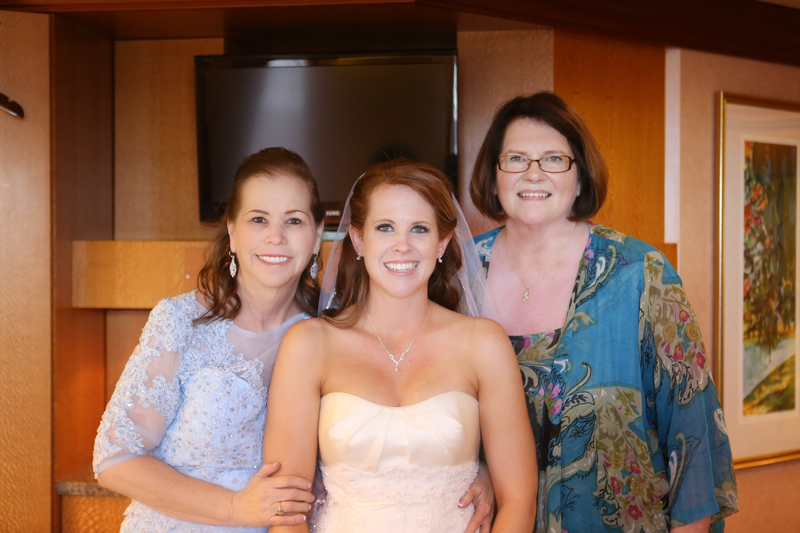 Then my mom and stepmom came in and helped put my veil on and perfect the bridal look. I was so ready to walk down the aisle and marry the man of my dreams! My wedding day was amazing and one that I will never forget. 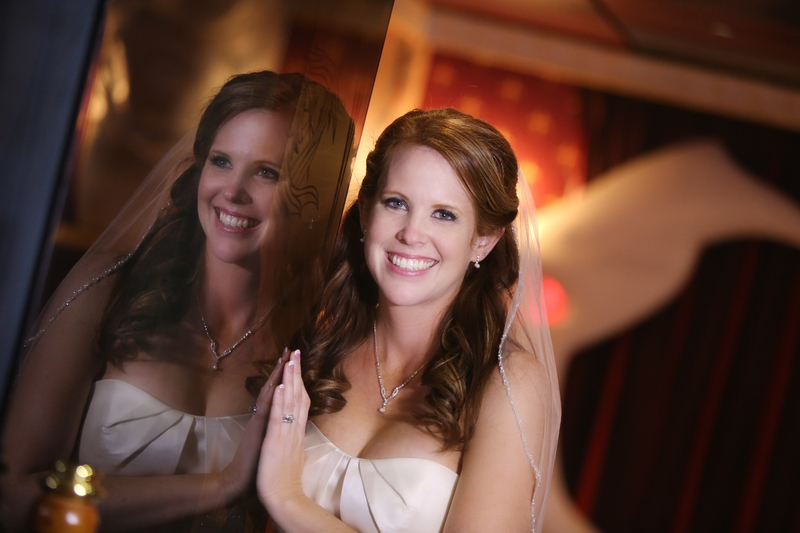 I felt like a beautiful bride that day and am pretty sure my husband thought so too! I was so happy with my decisions for my Bridal Hair and Makeup! The most beautiful bride, simply stunning, the lady did an amazing job on hair and your makeup was flawless, the dress was gorgeous and the bride stunning!!!!! Congratulations on your wedding, you’re such a beautiful bride. Your wedding hair do was lovely, the pretty bobby pins were a nice touch. First off congrats! And you looked amazing! I love the twists/braids with the cute flower pins. 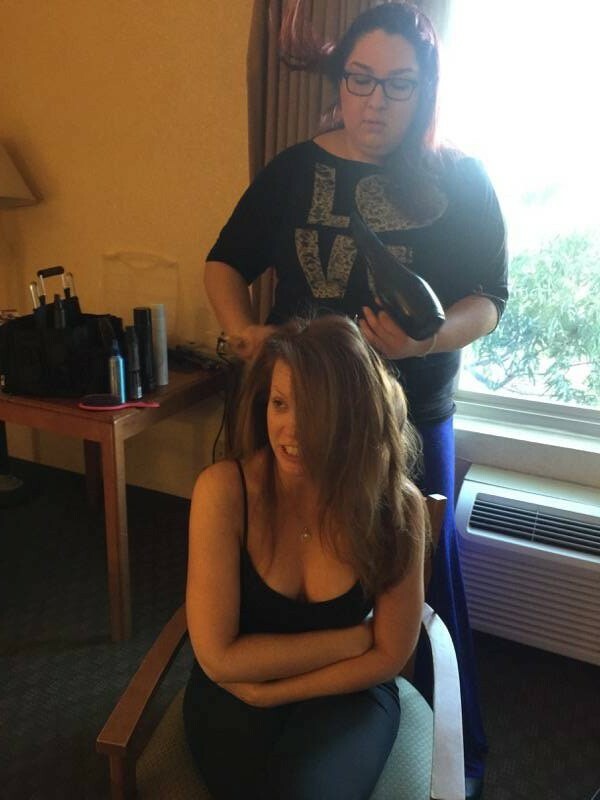 I loved my hair & makeup for my wedding too – I was so glad I had tested out a few looks prior to the big day – so I knew exactly what I wanted. Your hair came out great! I love the pins, I am going to find some with butterflies on them! I like the partial up and part down look! Congratulations! You hair and makeup are wonderful and you look amazing. The hairstyle you went with was perfect for your special day. This reminds me that I haven’t had my hair done by anyone else since my own wedding. Now I need to find a reason to get pampered! Your hair perfectly completes your look! It’s not too formal, but definitely special. I love how it turned out. Congratulations! You look just beautiful. I think it’s fun you changed your mind last minute about your hair. I’m sure either style would have been great, since they are both pretty timeless. I love the half up, half down style. It turned out so well, you were a beautiful bride. You looked absolutely gorgeous on your wedding day. I really like the hairstyle you decided on and think the fancy bobby pins were the perfect accent! You were the most gorgeous bride! We got married in my MIL living room in tshirt and jeans. Hoping to do the big dress thing when we renew our vows! Your hair and makeup look wonderful Not too overdone like I see happen once in a while. Much more natural. You look gorgeous! I love the hairdo! I actually had mine like that as maid of honor for my friends wedding, until she turned it around and made all of us get our hair on our heads and off our necks. I liked the first style much better though lol. Oh it looks so beautiful! Congratulations! Everything looks perfect. She did a nice job with your hair. I like the bobby pin accents. You make a gorgeous bride! Don’t you wish we could have someone do our hair and makeup everyday!?! I love the Starbucks cups! Getting them to put “bride” on it was an adorable idea! You looked gorgeous! 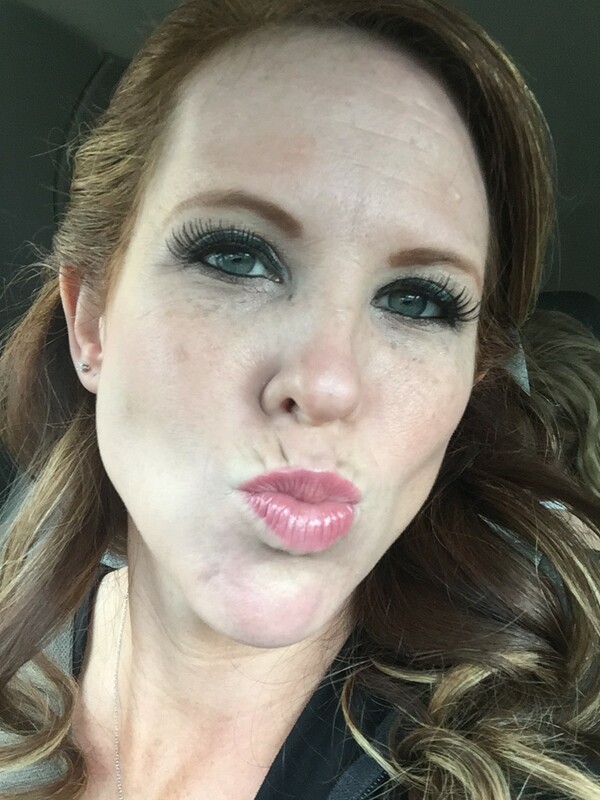 Your hair and makeup look stunning! You are such a beautiful bride! I love your hair, she did an amazing job. Congrats!!! You all look stunning. Hair and makeup are both perfect! So beautiful! Your hair and makeup look perfect! You looked so fabulous. I love the way you did your hair and makeup. Congrats again! 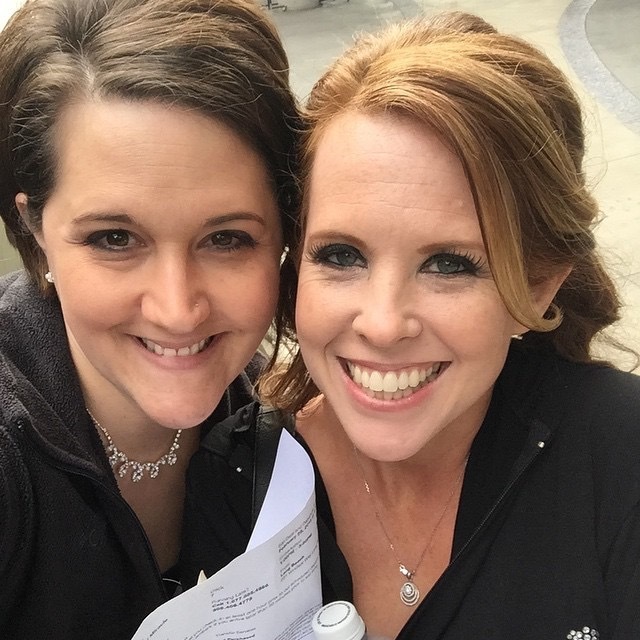 You looked gorgeous on your wedding day, as you should, I loved your hair! Congrats on your marriage. You looked stunning on your wedding day! 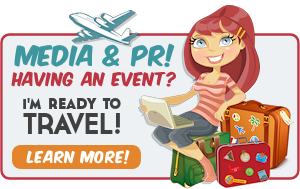 Hair, makeup, and dress… all picture perfect! Congrats again on your marriage! Super important decisions and they came out flawless! What a journey for you! wow! you look gorgeous!!! i love all these pics! the photographer did a great job. You looked amazing on your wedding day! Loved your hair, so pretty!